Yes, we can make pancakes from scratch, in fact, we can make Bisquick from scratch, but on Sunday morning it is just more fun to go with our Bisquick. Cook the bacon in a large skillet until the fat is rendered and the bacon is crispy. (Don't burn it! The difference between having all the fat rendered and burnt is the blink of an eye. Be vigilant.) Remove immediately from the fat. Save the bacon grease in a small bowl as you will be using it to cook the pancakes. 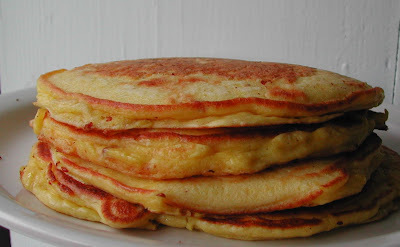 In a medium bowl (preferably a batter bowl, a bowl with a spout) mix the eggs and buttermilk followed by the Bisquick and stir till most of the lump are gone. It is pancake batter so there may be a little lump or two, but do refrain from leaving clumps. Crumple the bacon into the batter and mix again, briefly. You should leave the pancake until bubbles have risen across the surface of the entire pancake. (I must confess, I never wait that long, which is why my pancakes have a mottled appearance instead of a steady golden surface.) Turn the pancakes and give them another minute. Move to a warm plate. 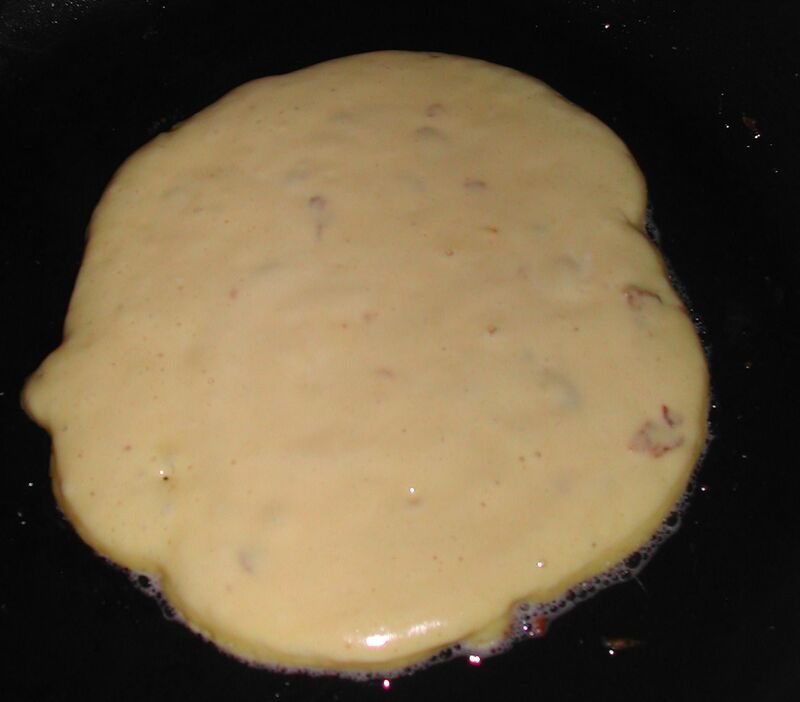 Add additional bacon grease as need to keep the pan lubricated so your pancakes don't stick. it broke because it wasn't ready to turn, but it tasted great. At Doe Run Farm, we serve our pancakes with homemade jam syrup. Homemade jam syrup is a great way to use that half jar of jam that is cold in the refrigerator and no one want to use because it doesn't spread easily as it did when the jar was first opened. In fact, one of the best ways to start out is to take the jar of jam, fill it to the top with water, recap the jar and shake gently or vigorously depending on how sure you are of the cap. Then just pour the jam water into the pan. Take roughly equal parts jam and water. Place in a small saucepan and bring to a boil. Reduce until the jam is syrupy. Pour over pancakes. Can i just say - YUM!!??!! I've been on a wheat-free diet this month, and it is torture. The second I'm off, this is what I'm eating!